any information regarding the identities of orderers, executors and performers of the murder of M. Bunkus, their location and route before and after May 30, 2018, as well as any other information regarding the activities of orderers, executors and performers and/or persons related to them. M. Bunkus’ family encourages responding every person who has information regarding individuals, including former and/or current politicians, public officials, and other persons who, possibly, put or have put any obstacles in the course of the M. Bunkus murder investigation. Including possible negligence and/or unlawful actions of such persons, including misuse of official position, corruption, blackmailing and fraud with regard to M. Bunkus’ murder and/or the course of its investigation. The video of the reward announcement is available here: link. 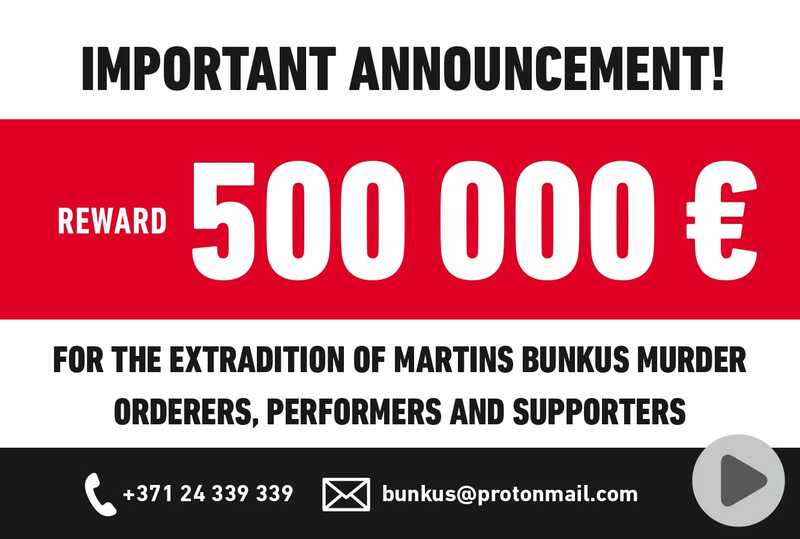 For the purposes of processing information received as a result of the announced reward, Martins Bunkus’ family is cooperating with professional providers of legal services, who will ensure the full confidentiality of information and cooperation with investigation authorities. Martins Bunkus’ family will continue their persistent efforts to expose the crime regardless of the time it will take. Persons who might possess valuable information are invited to contact by phone at + 371 24 339 339 or by e-mail to bunkus@protonmail.com. Read full information here. Anonymity guaranteed.